There is no doubt to the fact the Mini Cooper has evolved itself from small economy car that we had since 1960. The major reason behind gaining the recognition all across the United States is its dedication in bringing something new in its successive models. To keep the legacy alive they recently shared their revised Mini Cooper S 5 Door 2015. Being fitted with more power and enhanced space the model offers you comfort and performance figures. Let us have a look at the review of Mini Cooper S 5 Door 2015 o know more about it. The interior of Mini Cooper S 5 Door 2015 is far more spacious in comparison to the hatch version. However the interior isn’t just all about the space but it also offers driving fun, safety and connectivity. Being housed with electromechanical power steering with Servotronic function, the model has numerous other features like Dynamic Stability Control, Traction Control and Differential Lock control that comes as standard. Talking about the seats, they feature 3-point automatic belts while the airbags are fitted all across including the sides. The instrument cluster is very well designed featuring the road speed and engine speed through its color display. There is also an 8.8 inch screen at the center of dashboard bringing the infotainment and entertainment segment. In all with its all features and comfort the interior of Mini Cooper S 5 Door 2015 is undoubtedly worth a try. Apart from the extra pair of doors, the exterior of Mini Cooper S 5 Door 2015 has a lot more to take it a lap ahead of the predecessor. Starting with the front fascia the LED headlights that come with integrated LED daytime running lights sit aggressively at both the corners beside the hexagonal radiator grille. The LED lighting further extends its wings to the rear portion and brings for you LED tail lights beside the fifth gate of the model. Being finished in young paint the exterior of Mini Cooper S 5 Door 2015 looks remarkable and luxurious, taking a step ahead with this hatch to wagon transition. Getting back to the front section, beneath the circular lights is a pair of fog lamps while the center of bumper is covered by a massive air duct that pulls all the fresh air and passes it on. While at the rear end is a dual tip exhaust which adds a bit of sportiveness to the engine. Beneath the hood of Mini Cooper S 5 Door 2015 is a 2.0 liter four-cylinder engine generating total output of 192 hp and peak torque of 280 nm mating to six-speed manual transmission as standard while the option of six-speed Steptronic transmission remains. 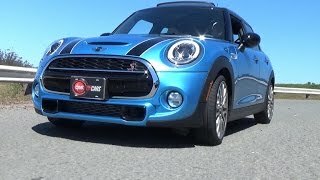 With this power rolling its 17 inch wheels, the top speed of Mini Cooper S 5 Door 2015 touches the mark of 145 mph while the 0-62 mph sprint can be knocked in just 6.9 seconds with its manual transmission while in only 6.8 seconds with the automatic one.